Here’s an egg from our neighbors during our summer vacation, from hens running around eating what they can find in nature. Have you ever seen egg yolk this yellow? We bought some eggs last week. The shells were as thin as paper and the yolks were pale and ill-looking. What makes them like that? Intensive laying? Whatever it is, it's not good. Yes - in my childhood and teen years when we lived in village and bought the eggs from the local farmers. There was a hen run right next to our front lawn and - goodness - when they were all out,- did they make a racket!! I really feel like having boiled eggs with mayo for breakfast when I see that! 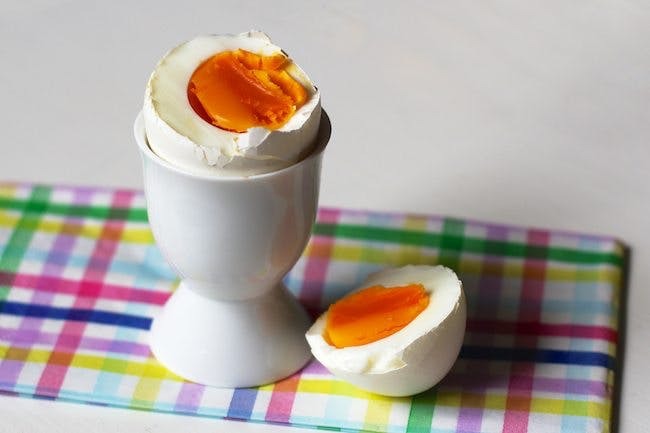 I read the comments from this post in Swedish and apparently the yolks get that type of colour from chlorophyll (grass) that free range chickens can pick in. B...B...B...but no matter how good those eggs look...aren't you guys worried about your cholesterol? Actually, commercial eggs have added (natural) colours to the food of the hens, to ensure a yellow yolk with the same colour all year round. The point about food dyes in the chicken-feed is all too true unfortunately. On a related note I read that both salmon farmers and zookeepers rely on doses of a carotenoid, such as canthaxanthin or a similar pigment, to keep fish and flamingos colourful. I had a real good brekkie but my word I could eat that! Waitrose here in UK do high Omega 3 Free range eggs that have a nice yellow but variable colour yolk and I would recognise them and distinguish them from other good quality eggs although we only buy organic/free range eggs not all free range are the same! I bet that tastes nice...yum yum! I grew up in a city called Izmir in western Turkey during the mid 80's. Every Sunday, a market would be put up on the streets with people from villages all around coming to sell their produce. Kind of like the farmers market idea but those days that place was the source of produce for the entire neighborhood, there were no supermarkets! The tastiest, freshest eggs I have eaten all my life were from that place, I which I could go back to those days! It's great when you have access to real free range eggs, isn't it? We are very lucky that we have three neighbours who keep chickens and give us eggs like that. Only in Cancun, Mexico. In the US, factory produced eggs tend to have pale yellow yolks and thin, fragile shells. Beautiful! I actually am blessed to eat eggs this dark in the yolk every single day... My family and I raise our own meat birds, and have a large flock of egg birds which include ducks! American eggs get the yellow in their yolks from tumeric added to their feed. Without it, the yolks of US store-bought eggs would be gray. That is simply not true. Turmeric has been added to feed for broiler hens only in the last ten years or so, mostly as an alternative to antibiotics and growth hormones. The turmeric may intensify the yellow of the egg yolk, but the yolk would not be "gray" without it. I moved to Germany last year. The first thing I noticed different about the food was how the yolks weren't a light yellow, but instead a rich orange-gold. The eggs often have feathers stuck to them when you buy them. In the US, our food is "purified" so much that it can't help but have an effect on it. It's great to find food here that isn't loaded with preservatives either! AND the food is less expensive compared to the US. I have seen eggs with yolks that _orange_ on few occasions in America, but when I've visited Bosnia, those were just what "normal" eggs looked like. Heck, everything tasted better over there, and the food looked, well, real... (which is not something you can always say here in America). Let's hope that some day real eggs like the one depicted above will be so familiar to everyone that it won't even be a subject worthy of a blog post.